Once you loaded data into EasyMorph (and profiled it), you can start transforming it. 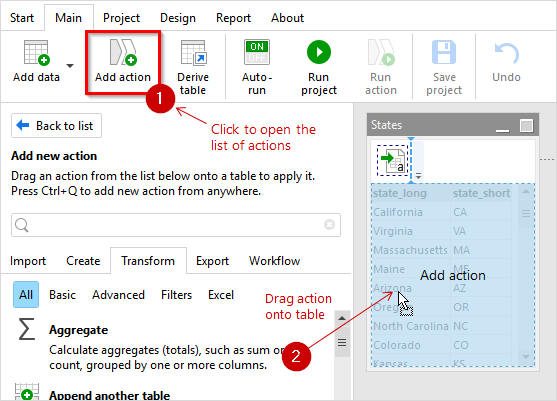 The basic way, which can be used for all actions, is to click "Add action" in menu Main to get the list of available actions, and then drag needed actions from the list (in the sidebar) right onto a table. You can insert actions at the end of the actions chain, or between existing actions. 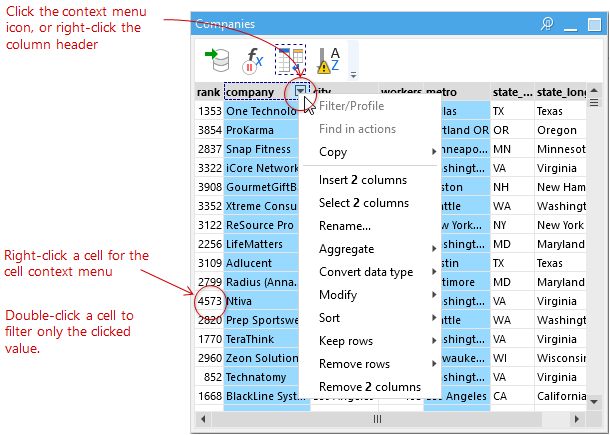 Another way to transform data is to use the context menu commands. For instance, when you click the context menu icon in a column header (or right-click the header) and choose Remove column EasyMorph automatically creates the "Remove columns" action with the current column(s) selected. You can apply the commands from the right-click menu to multiple columns at once. To select multiple columns Ctrl+click their headers. 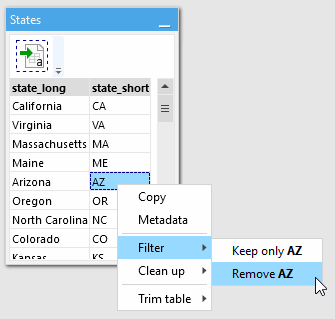 You can also use the cell context menu to automatically create "Filter", "Clean up" and "Trim" actions. Right-click a cell and choose a command. Note that in some cases automatically created actions might have incomplete properties. For instance when you aggregate data using the column context menu EasyMorph automatically creates the "Aggregate" action and tries to guess anticipated aggregated functions and grouping. To change the aggregation function and grouping you may need to additionally edit properties of the "Aggregate" action in the side bar. The full list of available actions with examples is available in the web-help. See Help: actions.